When the Phillies came to the ballpark tonight, they stood no chance. That’s because Bronson Arroyo was pitching, and pitching extremely well. Mix in Aroldis Chapman to close it out, and this one was over before it started. The final score was3-2, but the gap between the two teams was almost much larger compared to what the scoreboard read. – It’s no secret that Vance Worley has struggled mightily over the last two months. Since July 1, he’s 2-4 with a 5.92 ERA. During that span, he’s pitched 48.2 innings, but recorded just 34 strikeouts while walking 20. Looking at his career marks for K/9 and BB/9 (7.78 and 3.20, respectively), his strikeouts are down and his walks are up. That’s always a recipe for disaster for a pitcher, and begins to explain Worley’s struggles. But more than that, Worley is playing with bone chips in his pitching elbow. That, no doubt, is affecting Worley in some manner, despite the fact that he says it isn’t. – It was more of the same for Worley tonight. He worked hard early on, throwing 52 pitches through the first three, but managed to escape without any damage. After a rocky fourth where Worley went unscathed (more on that later), the Reds finally broke through with two runs in the fifth. Following a clean sixth, Worley was up to 99 pitches, and would call it a night. He allowed eight hits and walked two, but he battled out of jams all night, never retiring the side in order. Considering how bad it could’ve been, I’d say the Reds won this game more than Worley lost it. – Facing the Phillies has been no walk in the park for Bronson Arroyo, as his 7.28 career ERA indicates. In fact, things have been so bad for Arroyo against Philly’s hometown nine, he hasn’t recorded a win against them since 2000, when he was a 23-year old rookie pitching for Pittsburgh–and that was the only win he had against them in his career. But, as I’ve said about opposing starters all season, those numbers were compiled against a much different lineup than the one Arroyo faced tonight, and it showed. 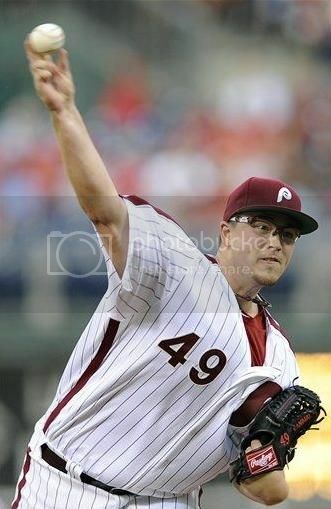 – Arroyo was perfect through four, and kept the Phils bats off balance throughout the night. The only run the team managed came when Domonic Brown broke up the perfect game bid after 4.2 innings with a solo home run, his first of the season. The homer was one of just three hits the Phillies managed off of Arroyo. The other was Brown’s eighth inning double and a ninth inning single for Kevin Frandsen. – An error by Domonic Brown in the fourth inning looked certain to lead to the Reds first run, if not for some heroics by the same man who put the Phils in the stick situation. Here’s how it went down: Leading off the fourth, Jay Bruce lifted a ball high into the Philadelphia night. Brown began his pursuit, but it quickly became apparent he could not see the ball. What should have been a routine out ended up landed about 15 feet in front of Brown, allowing Bruce to motor around the bases to third. Following an and a hit batter, Todd Frazier hit another fly ball to right field. This time, Brown caught it, and uncorked a mammoth of a throw that beat the tagging Bruce to the plate by a good ten feet. The throw was one of the best I’ve ever seen and completely saved Brown from being a goat with his gaffe. Of the position players, Brown was the only one who provided some real positives tonight. – It’s been a rough start to Josh Lindblom‘s career as a Phillie. After the eighth inning home run he allowed tonight, he’s now given up seven runs in eight innings since being traded from L.A. for Shane Victorino, good for a 7.88 ERA. It’s a microscopic sample size, but Amaro and co. have to be disappointed with what he’s shown them so far. The run would prove costly because…. – Facing a flamethrower in Chapman, the Phillies chances of staging a ninth inning comeback were slim. That didn’t stop them from trying though. Ty Wigginton drove in the second run of the night on a one-out single. That brought the winning run to the plate in the form of Chase Utley, whom Chapman struck out to end last night’s game. Utley would not stike out tonight. He would fly out, though, leaving it up to Ryan Howard. He’d line out to end it. -The Phils try to salvage a split tomorrow as Cole Hamels takes the mound. He’ll have a tough task, starting opposite NL Cy Young contender Johnny Cueto.